My usual blogging timetable is currently a work-in-progress whilst family stuff keeps my busy, hence the third sponsor post in a row but I didn't want to miss these out. There's been some great fabrics arriving at Plush Addict and April/May is a bumper time for sewing with more light and seemingly more hours in the day, oh yes and weather that doesn't require wrist to ankle body coverage. Fat Quarter Bundle Fabric Freedom. 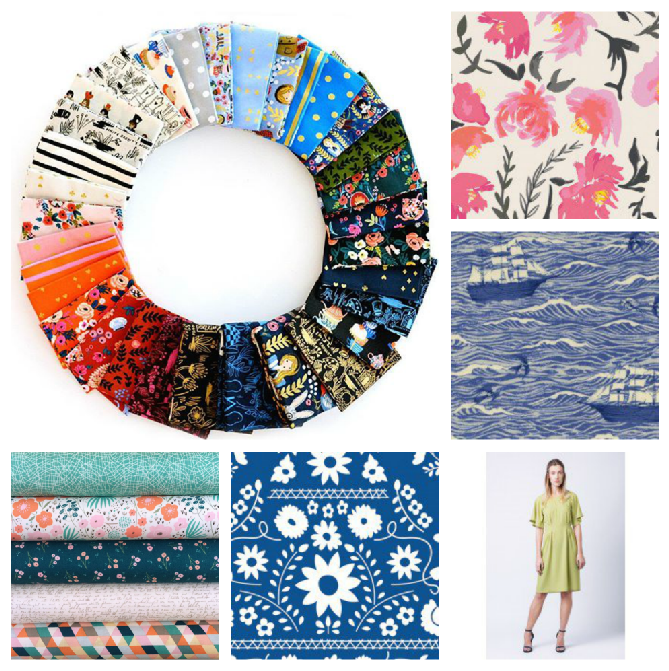 Bumper bundle of retro floral prints from Fabric Freedom and some blenders from other manufacturers. Riley Blake, Penny Rose Bunnies and Cream, Main Cream. 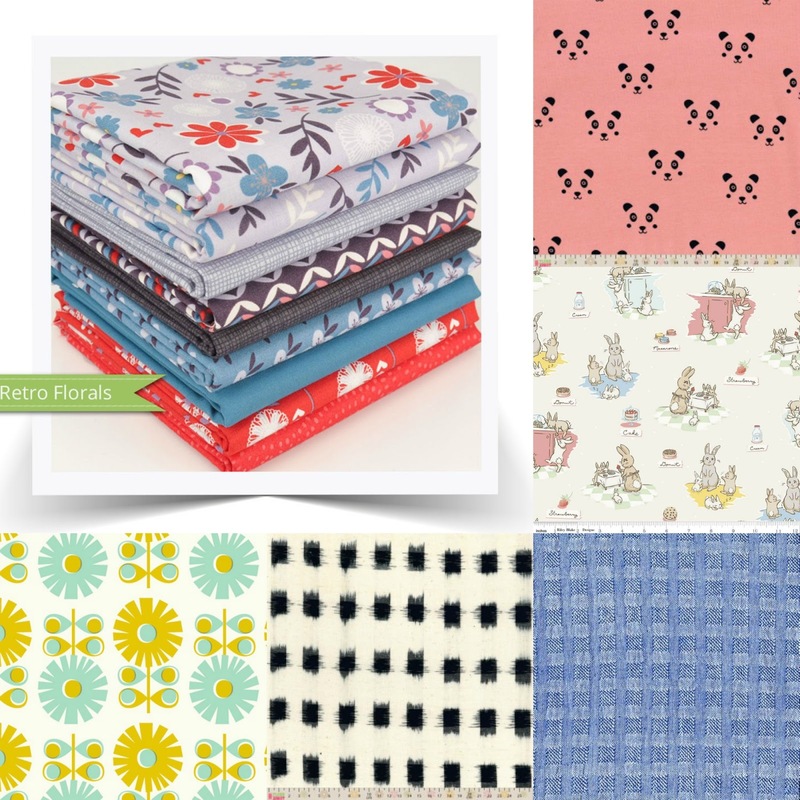 Hard to resist the cute retro illustrations and patterns in this quilting cotton range. See other available prints here. Blank Intermix Dobby, Seersucker Blue. More blue...loving the textural appeal of this one! Every Day Colour Woven Ikat Black. So popular in dressmaking at the moment, especially for simple shapes. The shapes come from the yarn dyed thread in the weave. Dashwood Confetti, Large Flower. My favourite from this screen printing inspired, retro floral range. Second in a row for my April sponsor posts and it's Eternal Maker's turn. Yes, blue does feature again, no apologies, plus I cannot deny the lure of candy colours! Succulents Kona Solids bundle. A selection from the Eternal Maker team, FQ cuts. Deer & Doe Sureau Dress. Mid-season dress with a mock button placket bodice detail. Feathers Fall Grey Cotton/Viscose. Dressmaking fabric, cotton and viscose blend so expect a lovely drape and a soft fabric. Cloud9 Organic Tinted Denims. Twill weave denims in a palette of ice cream tints, 8.5oz weight, perfect for jackets, dungaree dresses, skirts with a bit of body and shape! Plus Yarn dyed in blue, Indikon Robert Kaufman Fabrics. Gorgeous colour, gorgeous texture- the crosses are created with a floating weave of threads. 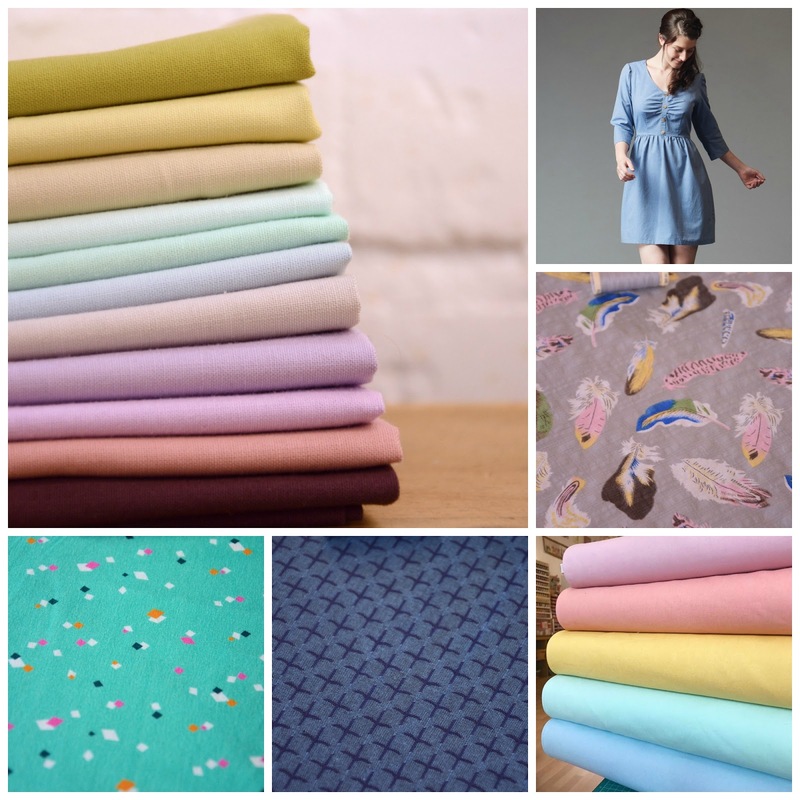 Dance Mint Cotton Candy Dashwood Jersey, New cotton/lycra jersey fabrics from Dashwood Studio. Wonderland Collection by Rifle for Cotton+Steel. This is one of the most popular ranges around at the moment and I know lots of people can't resist buying the whole range, it has such appeal and the use of metallic detail is just beautiful. One of two prints look like they've sold out but the majority are still available and there's some canvas, rayon and lawn options too. Wonderful Things Knit: Aquarelle Study in Tint, Bonnie Christine for Art Gallery. 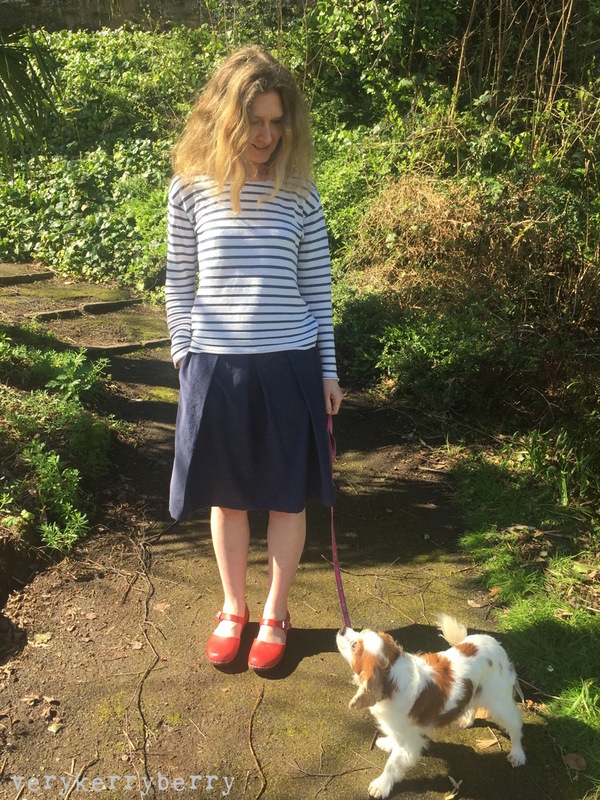 Gorgeous knit for spring, full of vibrant colour, 95% cotton 5% lycra and 150cm wide. SS Bluebird Cotton+Steel. I cannot resist blue. Ansa Butterfly dress and top by Named Clothing. One of my favourite Named Clothing patterns from their newest collection. Fiesta Fun Knit: Mexican Dress in Midnight, Dana Willard for Art Gallery. Another example of not being able to resist blue, but the print is exceptional too, looks amazing in simple shapes, 95% cotton 5% lycra and 150cm wide. Ava Rose Fabrics Pretty mix of florals, geometric and mark making prints by Deena Rutter for Riley Blake, quilting cotton. 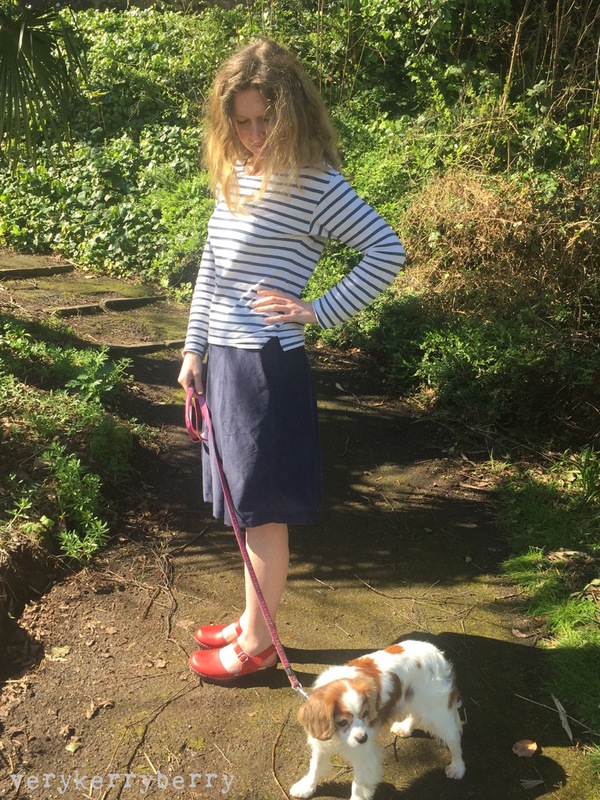 Spring means shorter skirt lengths and bare legs whenever possible. Liesl+Co's new Soho skirt/shorts pattern came out at just the right time for me, I had registered for the notification of sale and thenI had an email from the company offering a chance to try out the pattern in digital format for a review, very fortunate timing, so here it is worn with last year's Maritime knit top. 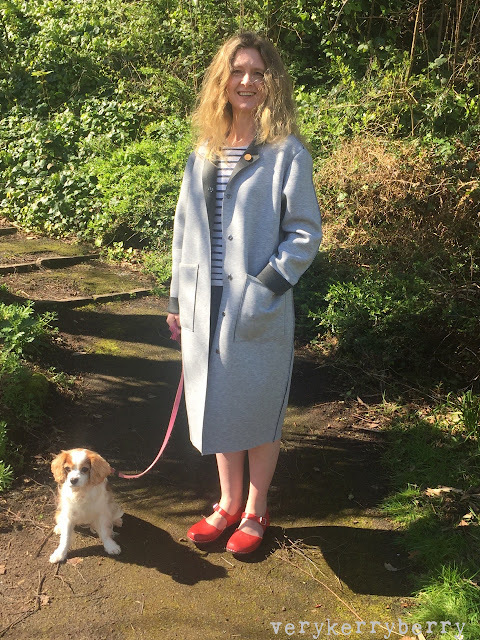 If you've every made any of Liesl's patterns before, her brands include Liesl+Co, Oliver+S, Straight Stitch Society and Lisette for Butterick, you'll know her instructions are probably the best in the sewing pattern world for clarity, detail and quality and finish. 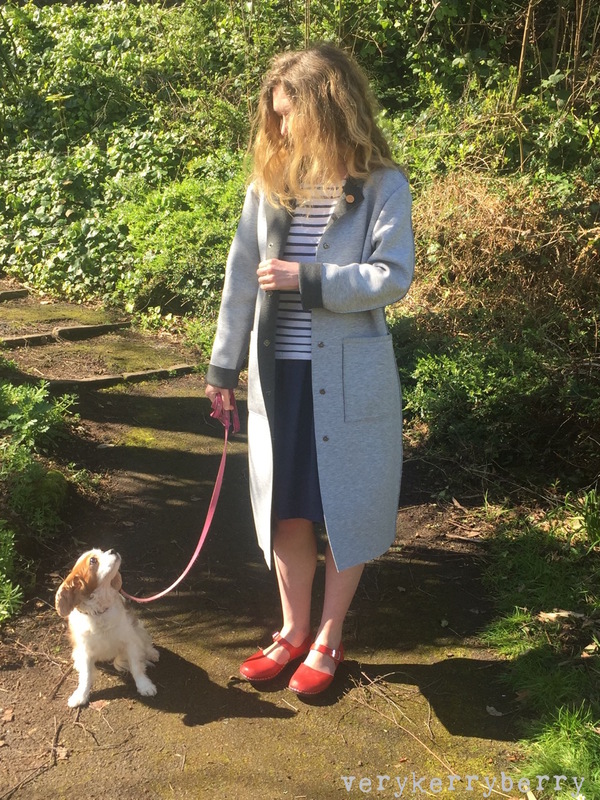 Her shapes tend to be simple, modern casual styles with some clever twists on traditional features like pleats and pockets. 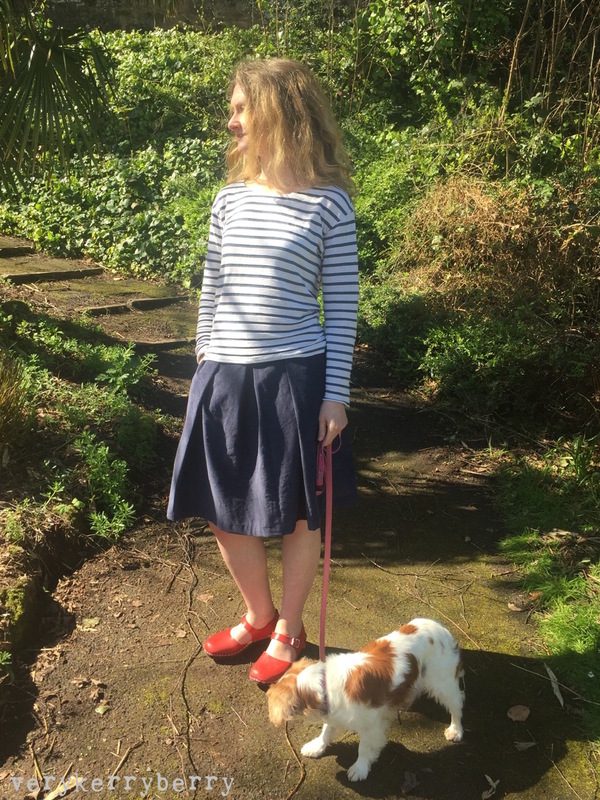 This skirt appealed to me primarily because I love a contour waist band- this style has it as well as a dandy way to stabilise it. I don't think anyone likes putting PDF patterns together but I do appreciate when they are thoughtfully designed for this process. Liesl+Co patterns on printed with a grid making accurate matching nice and easy. My favourite feature was something I haven't seen before, as each pattern piece became complete, it had a scissor line bordering the actual piece so you could safely cut it out during the assembly rather than struggle with the large master sheet of paper stuck together, very nifty! It's a relatively quick garment to make. As expected, instructions are exemplary, everything including when to finish and how is included. I used some Liberty for the pocket facings and to finish the waist band edge and concealed zipper end. It's a simple style very well done. I wanted a pleated skirt which had fullness without too much bulk and with a comfortable waist and that's exactly what I got. 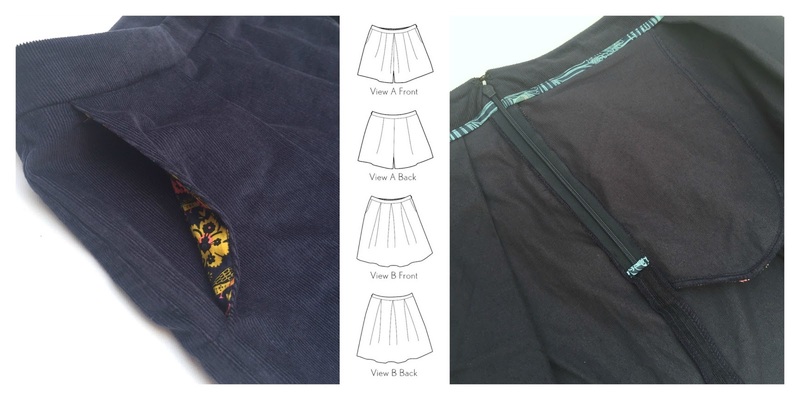 The front pockets are a good size and add to the flattering cut as the sit more smoothly than side seam pockets. Fitting is based on waist size. I was between size 4 and 6 so I went upwards and cut a size 6 and made no changes. It's a little big and sits quite low on the waist so next time I'm cutting between sizes. I used some left over needlecord. 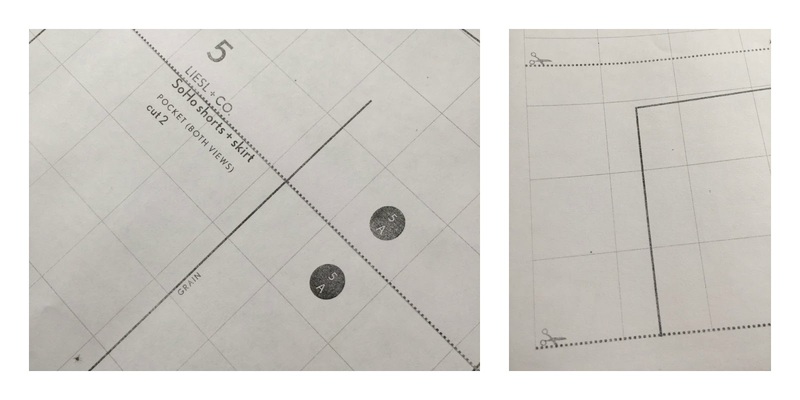 It's a pattern that could look different according to fabric choice. Canvas and brocade with give you a more structural, formal look and viscose and rayon would have lots of drape so lie much closer to your body. I'm going to make a second skirt in a linen/denim blend and I also have some viscose in my stash that I think would work for the shorts in anticipation of summer days on the beach. 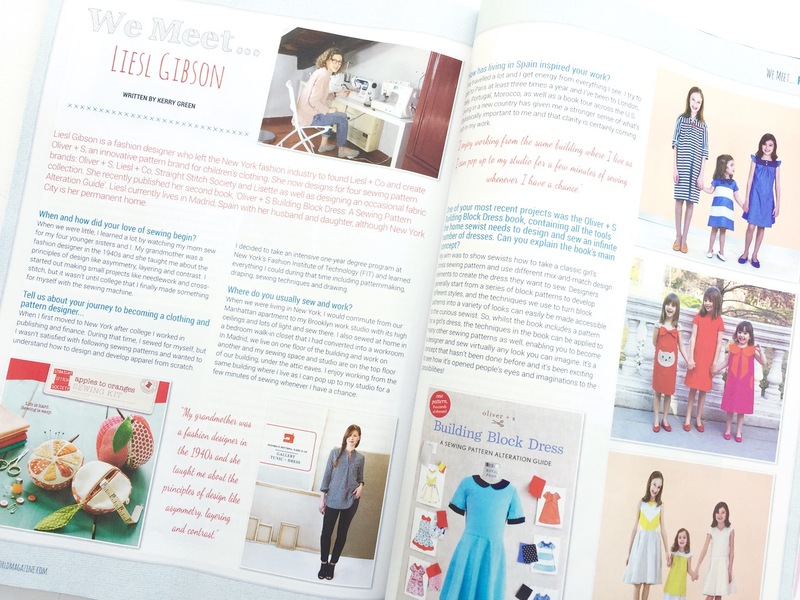 I've got lovely long interview with Liesl in the new May issue of Sewing World magazine- 4 pages of info all about how her designs, her new Building Block Dress Book and living in Spain, all accompanied by beautiful photographs. Enjoy the rest of your weekend. We've all enjoyed spending some time together again and getting some fresh air. Thank you for your kind words following my last post, he's doing well. I've just come out of one of those situations in life where everything goes into slow motion and you watch yourself and those around you go into free fall. My husband suddenly ended up in hospital for a prolonged period and what seemed straightforward escalated into something else. The good news is, we all came out the other side, but the last few weeks have been chaotic and challenging. 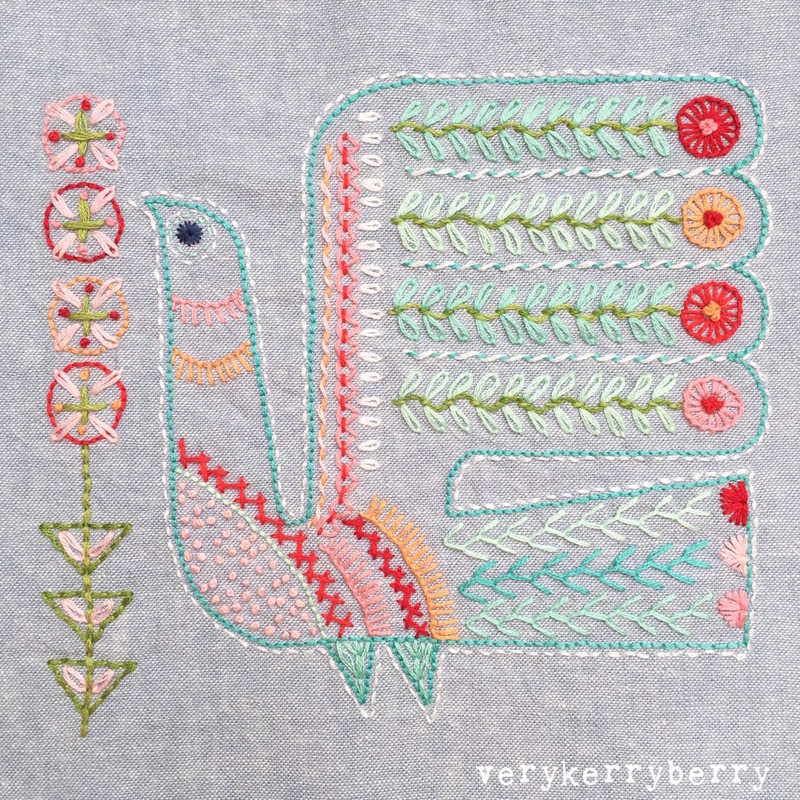 There was a lot of time to kill so in between staring out of windows, I sewed up the folk bird pattern from Nancy Nicholson's Modern Folk Embroidery book. The original pattern is a felt appliqué design with embroidery on top but I needed something simpler and portable so I used Sulky Sticky Fabric Solvy which I ended up loving and hating but I've now decide I would use it again. The pluses are that it's printable: inkjet or laser printer, and the stabiliser sticks on top of the base fabric - I used Robert Kaufman yarn dyed Essex linen in Chambray. The downside is I could feel the stickiness as I gripped the embroidery hoop - not good for hot hands! I worked around this, outlining the main design and trimming back the solvy as far as I could and after initially finding it rather tough to sew through, I found it did a great job as a stabiliser as well as being an easy way to transfer a detailed image. I tested scraps of it before I started sewing to check it did dissolve in water and it does, with a little soaking, in a rather magical fashion. There's probably about twenty hours of embroidery in the finished piece. I haven't decided what I'm going to do with it yet. Probably a small frame, maybe a fabric border. The Cosmo/Lecien threads were from a Fat Quarter Shop Bonnie and Camille colour selection from a one-off Sew Subscription box I bought a few months back and I used the Primitive Embroidery act needles that came in the same package and I really like sewing with them. I tended to use three threads of the six-strand floss at a time which worked well with the long eyed needles. 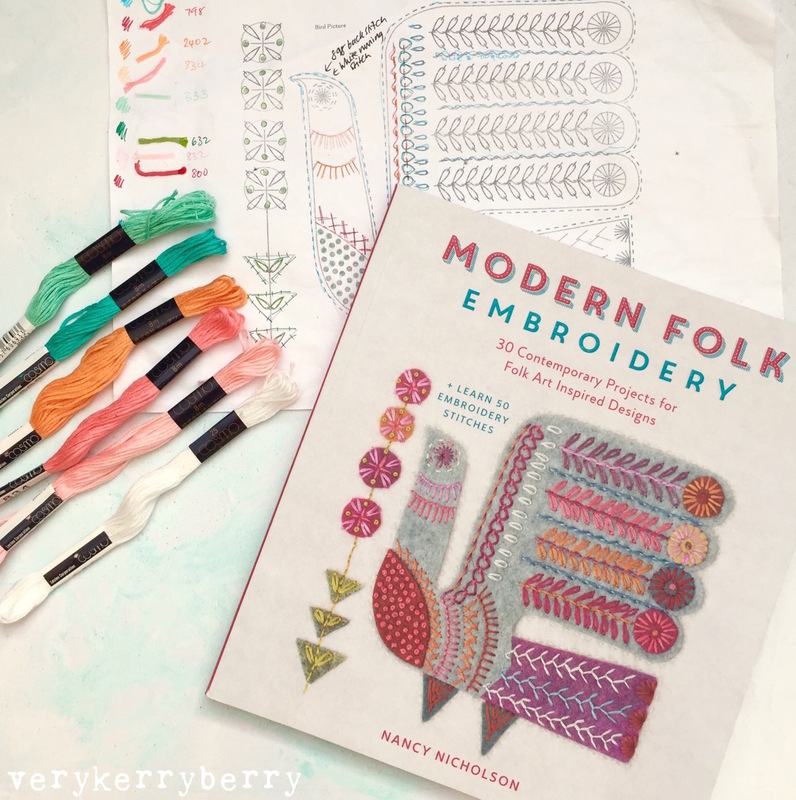 Embroidery like this with a printed design is the perfect distraction, it needed enough engagement for me to concentrate but not so much that I messed up and helped to pass what seemed like endless stretches of time. 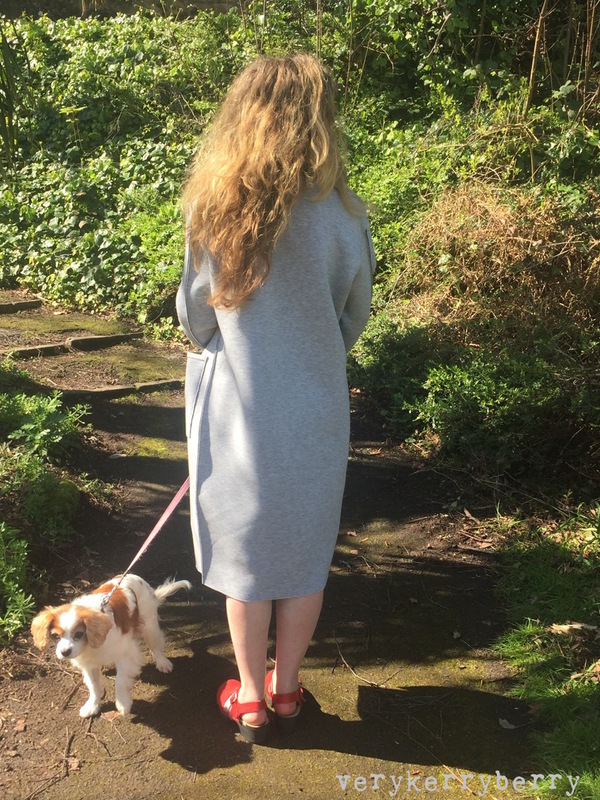 I'm currently getting everything back on track at home and feeling very grateful that we're all here together, you never know what's round the corner. Using the Spring Chick block from the Spring Fever pattern set, I made a quick sandwich of batting and backing fabric and some outline quilting on the machine. I then trimmed the block to the original square, folded it in half lengthways and drew a half egg shape free hand. I cut through the double folded layer to create the egg shape. Then stitched ⅛" from the edge to secure the layers and finished with single bias binding, 1 ½" wide and included a loop. 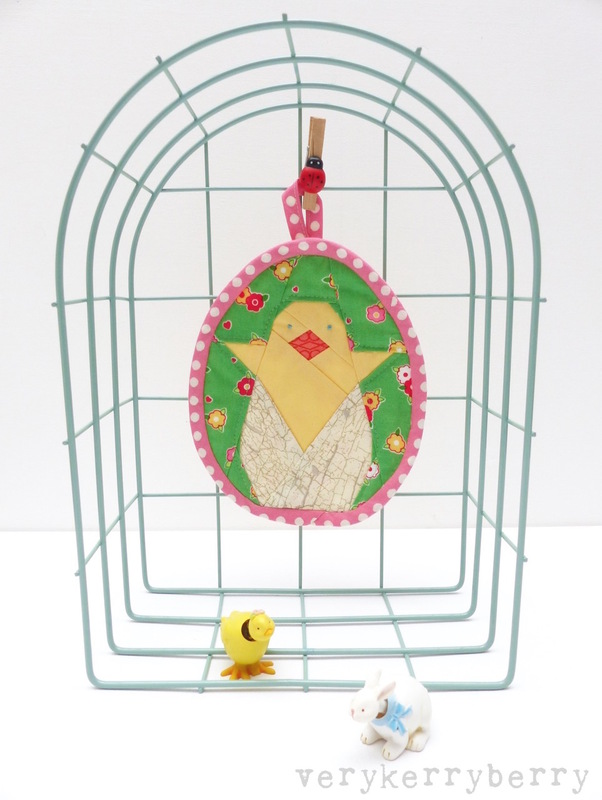 The Spring Chick can be found in the Sew-Ichigo pattern set which includes lots of other birds as well as tall and short tulips and the same patterns are also available singularly. 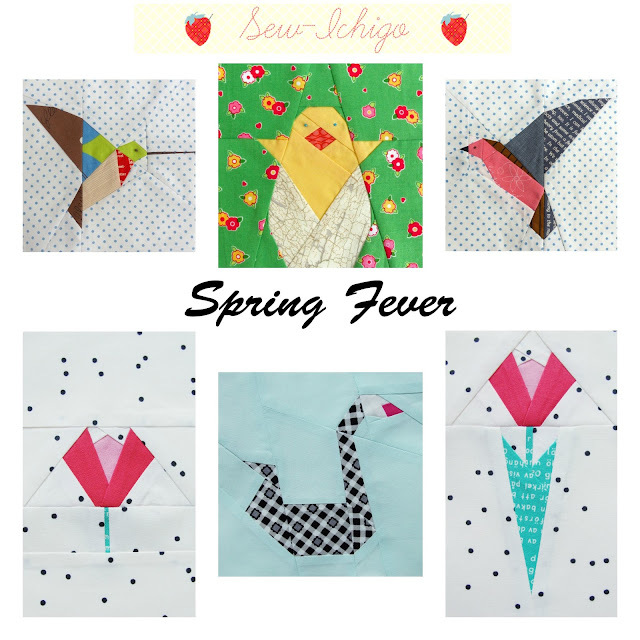 Find the patterns in the Sew-Ichigo Payhip and Craftsy and Etsy shops. All the designs are foundation paper pieced. 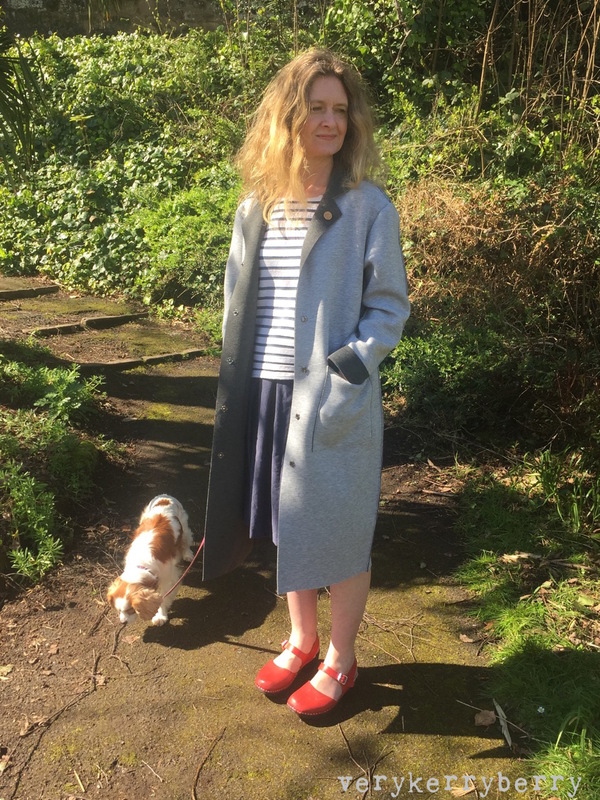 I recently reviewed Frances Tobin's Essential Collection book which is packed full of classic wardrobe staples with a modern twist and I've been itching to make something from it so I temporarily abandoned my #2017makenine as it's been progressing nicely and chose the raw edge coat as I though it would be a handy garment for Spring weather. Very different to what I usually sew and a quick project too. Here it is on its first outing in a local park last weekend. Walking foot. This is bulky fabric, I used my Janome and the Acufeed foot. Many edges are raw. I changed this for the top of the pocket as I thought this might get a little bashed about so I used a jersey binding using this viscose binding from Eternal Maker. although the light grey is sold out I think. The coat sizing is one of the mixed-size patterns in the book that span two sizes. I used size 1/2 which is size 32-34" bust. I am 33" Bust, 27 1/2" waist, 36" hip. Armscye- this seam is on the inside. removed ⅜" around the seam tapering to join original seam line at underarm. Use a double thread but instead of threading the loop through the eye, instead thread the ends through the needle eye and have the loop at the end of the doubled thread - do not tie a knot! Push your needle through the fabric to create a small stitch but do not pull the end loop through; instead pass the needle through the loop and gently pull. Your thread is now attached. You can then sew your snap or button. Once sewn on you will cut the thread so you cannot repeat the same technique with the same thread so I used 18" length of thread to sew on each part of the snap. A nice effect of this fabric was the dimples the fabric makes under the tension of the hand stitches. It's a soft and easy wear. I did feel a little self conscious going out in what seems like quite a grown up style but it's so comfortable and easy to wear I've found myself putting it on for all my dog walking this week as the weather is dry but a little breezy. Hmm, sounds like a great transitional piece for Spring as the fashionistas say. 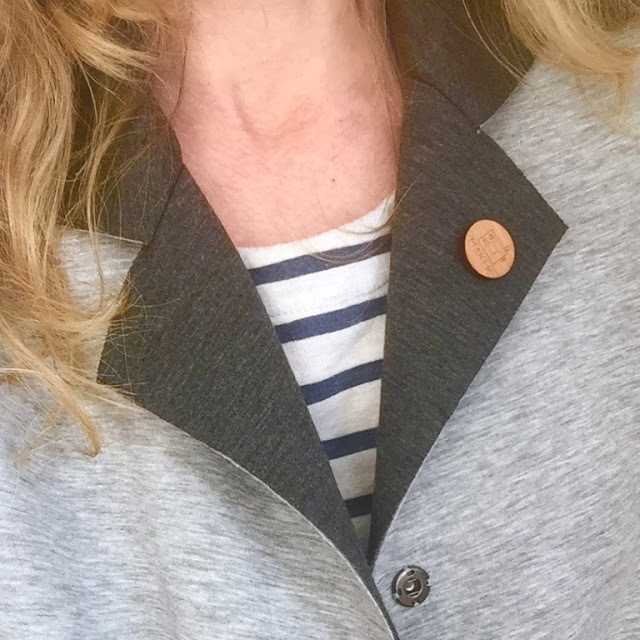 I did add a new wooden badge pin, Maker from Grace's beautiful Beyond Measure shop. I've been destashing lots of things recently so this was a little treat. Made by Arrow Mountain, See the full range of motifs here.